Heracles wrestles the river-god Achelous for the hand of the princess Deianeira. The deity is depicted as a bull-horned centaur brandishing a large, round stone. The hero grasps him by the neck and horn, as he prepares to snap off the appendage, and is equipped with a lion-skin cape, bow and quiver of arrows. The goddess Athena stands behind him with hand outstretched in a protective gesture. She wears a high peaked helm and serpent-trimmed aegis-cloak, holds a spear and has a shield propped against her leg. Ares, patron-god of the region of Aetolia, stands to her left, presumably offering his support to the river. He wears a knee-length chiton and helm with prominent cheek-guards, and carries a spear. 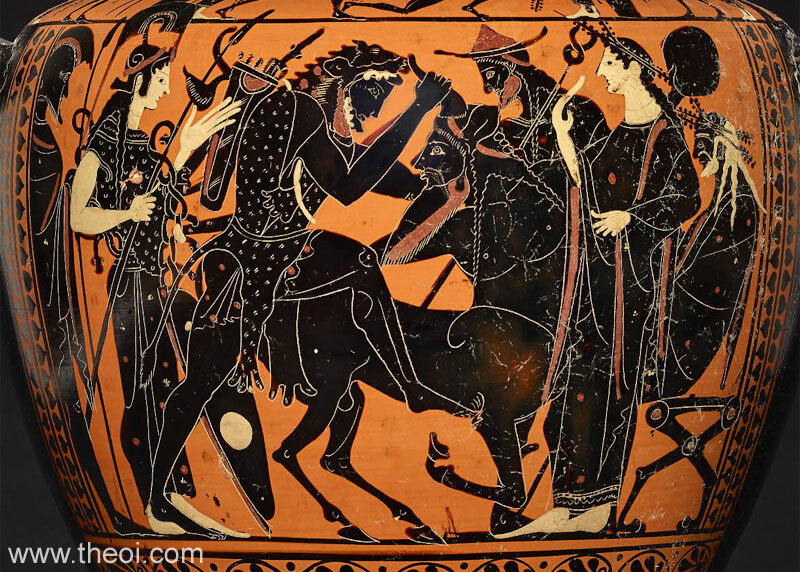 On the far right the god Hermes, equipped with a herald's wand (kerykeion) and petasos cap, stands before Deianeira and her father King Oeneus. The two royals are crowned with wreaths and the balding, white-haired king sits on a stool.